The purpose of this chapter is to present in detail the method and processes of the data analysis, and the results obtained from the analysis. Structured Equation Modelling (SEM) is adopted to test the hypotheses testing and mediators testing. This chapter also includes sample characteristics, descriptive analysis of the demographic profile of the respondents and descriptive statistics of the e-collaboration technologies. The testing of the measurement model covers tests of content validity, convergent validity, discriminate validity and reliability. The final research model results show all hypotheses have been accepted excepting Hypothesis 4. Collaboration' plays a full mediation effect on Trust and Business Performance. E-business diffusion is also a full mediation for this linked relationship. The results are reasonable according to the manufacturing e-business practices in Wenzhou. Demographic data covers the key source of information for an understanding of the basic characteristics and features of respondents. 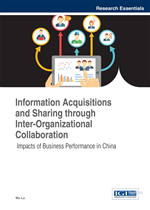 The sample profile provides a decisive understanding of the general pattern of attitudes of respondents towards the collaboration in organizations. Therefore, descriptive analysis is taken to assess the characteristics of the respondent profiles and related data.